In the world, there are seven sea turtle species, six of which live in Indonesia: Green turtle (Chelonia mydas), hawksbill turtle (Eretmochelys imbricate), olive ridley (Lepidochelys olivacea), leatherback sea turtle (Dermochelys coriacea), flatback sea turtle (Natator depressus), and loggerhead sea turtle (Caretta caretta). The leatherback sea turtle is the largest sea turtle species which has up to 2.75 meters length and 600 - 900 kilograms weight. While the smallest sea turtle in Indonesia is the olive ridley weighing around 50 kilograms. According to the Government Regulation (PP) number 7 year 1999 concerning the Preservation of Plant and Wildlife, all sea turtles in Indonesia have been protected by law. This means that the trade of sea turtle, both in alive and dead condition and also the trade of the by products is illegal. While according to the Law number 5 year 1990 concerning the Conservation of the Natural Resources and the Ecosystem, actors (traders and buyers) of sea turtle trade are liable to a maximum of five year prison term and a maximum of 100 millions Indonesia Rupiah. The use of protected wildlife is allowed for the purposes of research, science, and rescue of the wildlife itself. According to CITES (the Convention on International Trade in Endangered Species of Wild Flora and Fauna), all sea turtles are listed in the Appendix I meaning that the international trade of the species for commercial purpose is prohibited. IUCN also enlists the hawksbill turtle as critically endangered. While the green turtle, olive ridley, loggerhead sea turtle are categorized as threatened. The threat of sea turtles is the trade of the species and the by products like the meat, eggs, and the body parts. 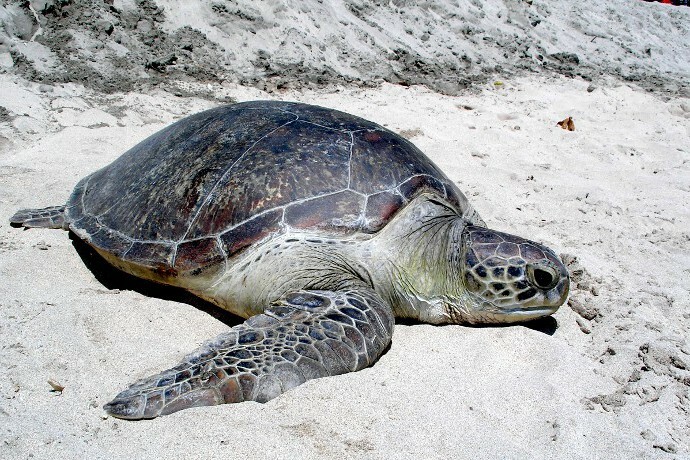 The species which is mostly traded is the green turtle. The trade of green turtle still takes place in Bali Island. While the sea turtle which is poached for the shell to make souvenirs for tourists is the hawksbill turtle. Sea pollutants like oil and plastic wastes also threat the sea turtle conservation. Sea turtle is a wildlife having lived since million years ago and can survive until now. Sea turtles are migratory animals and migrate thousand kilometers away from the nesting site to the foraging site. Sea turtles spend most of their lives in the sea but the mother sea turtles will land on the beac to lay eggs. Sea turtle mothers lay eggs once between two and four years and land on the beach for four to seven times to lay hundreds eggs and bury them in the sand beach. After 45 to 60 days of incubation, sea turtle hatchlings (babies) will show up from the nest and head for the sea to start their new lives. Experts say that among 1,000 sea turtle babies, only one can survive until it becomes an adult sea turtle. The life expectancy of the young sea turtles is very low that experts say only 1 - 2 % of the laid eggs can survive.